This is a post I've been meaning to put together for a while now. 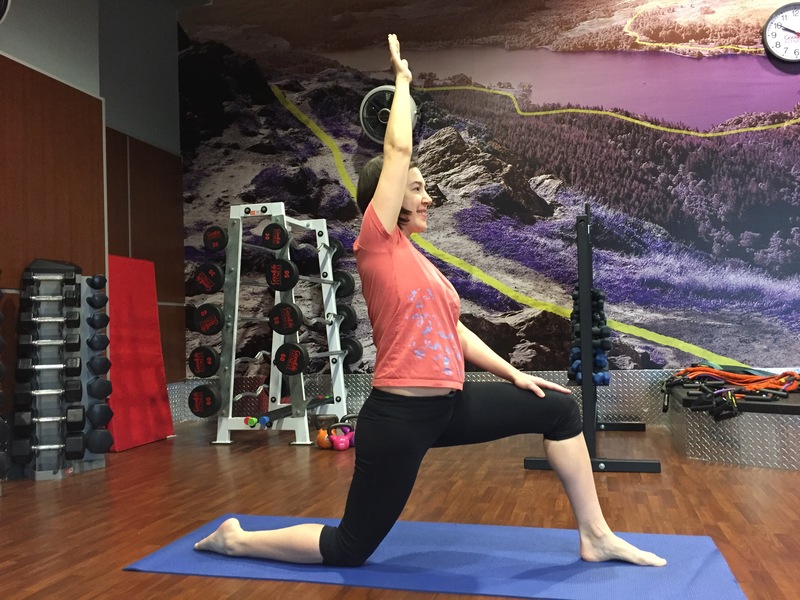 My friend Meagan Walker is a personal trainer, yoga treacher and team training coach at Goodlife Fitness on Weber street in Waterloo. She has helped me to put this all together for you. 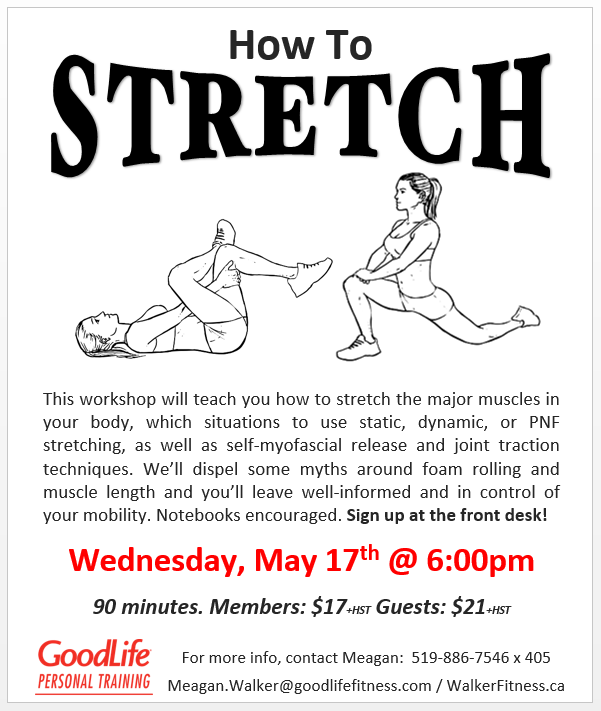 She is putting on a stretch workshop at Goodlife on May 27th. See poster below. This is a stretch for the hip flexors and quadriceps. It counteracts sitting & relieves tension from low back.The hipflexors are amongst the tightest muscles in our mostly sitting society. If we don't stretch these muscles out regularly, we are at risk of back pain, a pot belly and really bad posture. Common mistakes: The low back is pushed forward and the upper body is leaning back. Correct Technique: Scoop the tailbone under and push the hip forward; stay tall. This is a stretch for the glutes and piriformis (depending on angle). It helps maintain hip mobility and reduces sciatic type pain from tight piriformis muscles. Common mistakes: Leaning over toward the back leg and leaning too far over on the front hip. 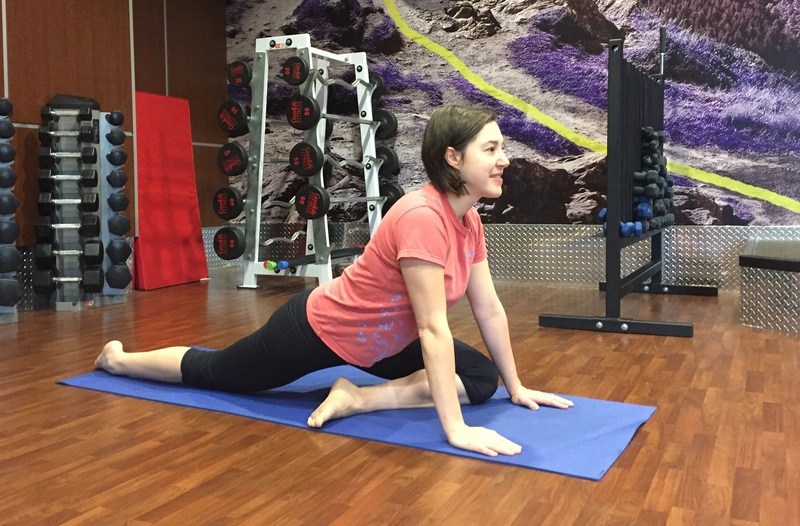 Correct Technique: Keep the pelvis parallel to the floor and to the front of the mat. This stretch is great for the side muscles of body, lower back, abductors of the top leg, obliques and the chest muscles. It maintains spinal mobility, inhibits lower back pain and improves room for breathing. It also stretches the often overly tight chest muscles. This allows for better lymphatic movement and reduces tension in the shoulders and back. Common mistakes: Forcing too much into the stretch to get knees on floor. Correct Technique: Allow the body to twist to a comfortable position and maintain deep smooth breath.